Nepal is a very holy place, comparable to Jerusalem in the western world, because it is the birthplace of Lord Buddha Sakyamuni. Furthermore, archaeology has determined that it was also the birthplace of the previous Buddha. 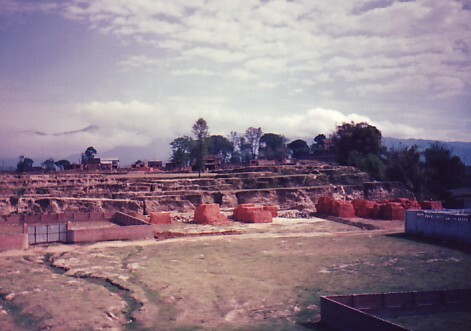 In Nepal also are the two places where Guru Rinpoche attained two kinds of complete enlightenment. 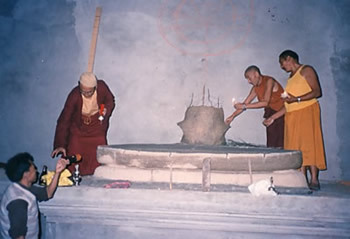 One is at Yangleshö, where he achieved Mahamudra enlightenment (Chakja Chenpo Rigdzin). Here, he also discovered Vajra Kilaya practice and subdued all hindrances to the dharma in both Tibet and Nepal. The second place is the cave of Maratika where he achieved deathless enlightenment (Tseye Rigdzin) with his consort Mandarava. Marpa Lotsa also received Dorje Phagmo (Vajra Yogini) initiation at Yangleshö and stayed there many years. In Nepal there are three Milarepa caves as well, one being the site of the famous occasion when he liberated a deer, a dog, and a hunter, who all became best friends with each other. And finally, there are the three Holy Stupas - Swayambunath, Namo Buddha and Bodhanath. Therefore, Nepal is a very holy place. I met the Nepalese teacher Rana Guru and gave him some initiations. He has been in retreat for over ten years now. He and his wonderful and loyal consort Nihru Rana honour me by inviting me to visit him in his special private retreat room from time to time. Also, I met Rita Thapa; she asked for an initiation to remove her hindrances, and I gave her some teaching and initiations. Rita is a very hard worker - she founded the TEWA Society for Nepalese Women, and has also opened a special cloth weaving building for some Nepalese families. My tsawai lama Dilgo Khyentse Rinpoche told me that it was because Nepal is such an important place that he had built a monastery there. He advised me to do the same and to construct a slightly wrathful looking Guru Rinpoche in order to subdue Kali Yuga problems. 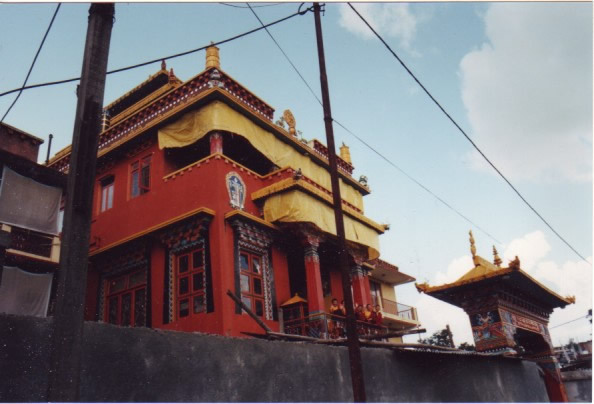 Therefore, in 1988, the Earth Dragon year, I purchased a piece of land near Bodhanath and started the building of the five-storied Tekchen Lekshay Ling, with a six foot golden gizera on top. Some good omens appeared at the time of starting Lekshay Ling. While we held an Earth Gods and Goddesses prayer and ganachakra puja, a light rain fell, and later two rainbows appeared over the land. I buried naga and Dzambala vases and, just as we were about to erect the main pillar, a man named Gyaltsen (Tib: rgyal mtsan - victory banner) arrived. I thought this good name to be another good omen, and he then helped us erect the pillar. Over the next little while, we invited Chobgyay Trichen Rinpoche, Shamar Rinpoche, T’ai Situ Rinpoche, Jamgon Kongtrul Rinpoche, Sadral Rinpoche, Chöling Rinpoche, Dazang Rinpoche and some other Rinpoches, all of whom visited and consecrated the land. Then later, His Holiness Sakya Trinzin, Tulku Urgyen Rinpoche, Chökyi Nyima Rinpoche and several other Rinpoches visited and blessed the Monastery.